With the popularity of Tablet, Samsung recently announced new line of devices that feature amoled displays, the Samsung Galaxy Tab S 8.4 and 10.5. The Samsung Galaxy Tab S 8.4 and 10.5 will come with either Exynos 5 (5420) octa-core SoC or Qualcomm’s Snapdragon 800 processor and will run on will run Android 4.4.2 KitKat . It will feature 3GB of RAM and a choice between 16GB or 32GB storage. The Galaxy Tab S will come in either LTE or WiFi-only models. 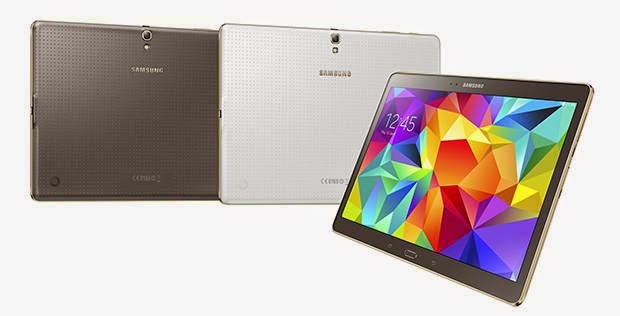 Both Samsung Galaxy Tab S will become available by July in select markets. Pricing and availability are not yet announced.